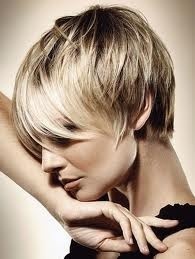 Pure Platinum – the hair is pre-lightened to almost white blonde, then softly toned with a hint of champagne tone. All of our hair color processes start with the best hair color in the industry. We search out the best pigments available to us in the industry and companies that will leave the hair closer to the natural virgin integrity vs the dried out experience. If you are looking for that special stylist–someone who is great with color and cutting–look no further! Do yourself a favor and schedule an appointment with Jennifer at the East York salon. She is highly skilled at both color and cut, and we all know how rare it is to find a stylist who is great at both! Jen is also friendly, upbeat, and down-to-earth. Model has short layered hair in the back accentuated with long fringe bangs in the front. Beach Bunny – sunny golden blonde hair coloring with light golden ash blond highlights throughout. 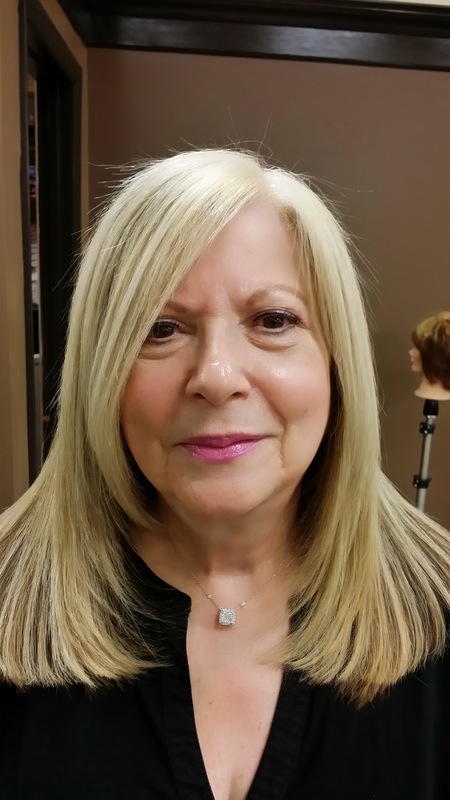 Blonde Goddess – warm golden blonde with sandy neutral highlights. Cowgirl Blonde – defines this frisky, energetic gal with a coppery blonde base with strawberry golden highlights kicking through. Butterscotch – more of a caramel golden base with medium golden highlights for richness. This is an extremely touchable look. Men can’t keep their hands off of this one! Platinum Diva – stands out in any crowd. The hair is pre-lightened to very pale blonde, and then softly toned to the palest white to create a sense of confidence. When you choose this color, pre-plan plenty of time for processing during your first appointment. A consultation is required prior to this service. Being a diva is a commitment to retouching every three weeks for maximum results. Ice Age – light ash blonde base with cool ice highlights. Whiplash – stunning ash blonde with golden or white highlights. This color certainly makes a strong statement of style.